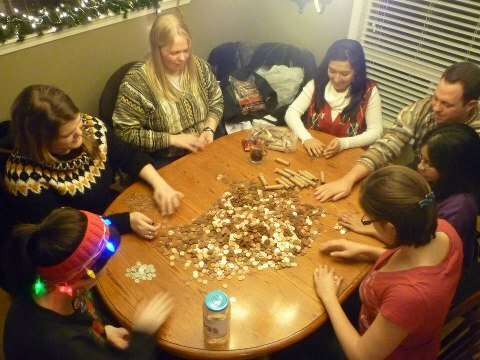 Milton Rotaract members recently roll donated pennies to eradicate poilio. Milton's Rotary and Rotaract Clubs are collecting pennies, joining forces to eradicate polio globally. Taking advantage of the "Pennies and More for Polio Initiative", the two clubs hope to eradicate polio by collecting donated pennies from the Milton community. This joint initiative between the Rotary Foundation, the Government of Canada, and the Bill & Melinda Gates Foundation presents an opportunity to engage Canadians in the global effort to eradicate polio. "Canada's deep commitment to eradicating polio has meant that hundreds of thousands of children have been immunized, often in remote, impoverished, and very insecure regions of the world," said Minister of International Cooperation Julian Fantino. "The unwavering commitment of countries around the world, and of organizations such as the Rotary Foundation and the Bill & Melinda Gates Foundation, will help put an end to this devastating disease, which can be prevented with a simple vaccine. The Pennies and More for Polio Initiative announced Sept. 27th will help us to achieve that goal." The Pennies and More for Polio initiative invites Canadians to join in the fight to eradicate polio. The Government of Canada, through the Canadian International Development Agency (CIDA) will provide funds to the Global Polio Eradication Initiative at a ratio of $1 for every $1 raised by Rotarians in Canada, up to a maximum of $1 million. The Bill & Melinda Gates Foundation will likewise provide funds of equal value, at a ratio of $1 for every $1 raised by Rotarians in Canada. This would result in every $1 raised by the Rotary Foundation leveraging an additional $2. Reaching the ultimate goal of a polio-free world presents ongoing challenges, not the least of which is a hundreds of million dollar funding gap. Of course, Rotary alone can't fill this gap, but continued Rotarian advocacy for government support can help enormously.